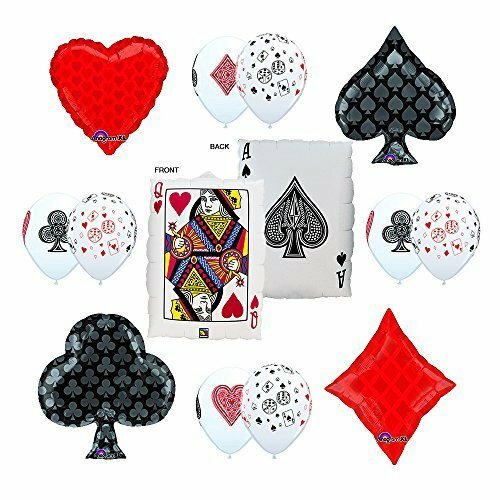 You will receive, (1) Two Sided 30" QUEEN OF HEARTS / ACE OF SPADES, (1) 22" RED HEART FOIL, (1) BLACK SPADE FOIL, (1) 18" RED DIAMOND FOIL, (1) 18" BLACK CLUBS FOIL, (4) 11" CARD SUITS LATEX BALLOONS AND (4) 11" CARDS AND DICE LATEX BALLOONS. Just add helium! If you have any questions about this product by Anagram, contact us by completing and submitting the form below. If you are looking for a specif part number, please include it with your message.